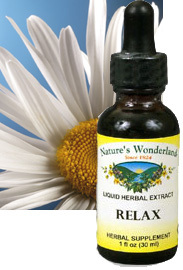 Relax Liquid Extract, 1 fl oz (Nature's Wonderland) - Penn Herb Co. Ltd.
Sleep better tonight so you can feel better tomorrow. RELAX is a potent blend of fresh Valerian, Hops, Chamomile, Kava and other traditional herbs that relieves occasional sleeplessness associated with pain. Fast-absorbing liquid formula. AMOUNT PER SERVING (440mg/ml or 30 drops): Proprietary Blend Certified Organic Fresh Valerian Root, Hops Strobiles, Certified Organic Vanuatu Kava Kava, Certified Organic Passion Flower Herb, Certified Organic Chamomile Flowers, Certified Organic Fresh Lobelia Herb, Fresh Pulsatilla Herb (ethically wild harvested). OTHER INGREDIENTS: Grain Alcohol (50-60% by volume), Deionized Water. Free of: milk, dairy, egg, fish, shellfish, tree nuts, peanuts, wheat, gluten or soy. Occasional sleeplessness; promotes relaxation; jet lag; minor pain; muscular discomfort; menstrual cramps; supports emotional well being; supports calm mood. 30-60 drops, 2-3 times per day or as needed in juice or water. (Best if used in the evening. For non-drowsy, daytime support, see Kava Gold, Item #SK260. For gentler formula see Zzzzzz Liquid, Item #SK440). DO NOT TAKE DURING PREGNANCY OR WHILE NURSING.